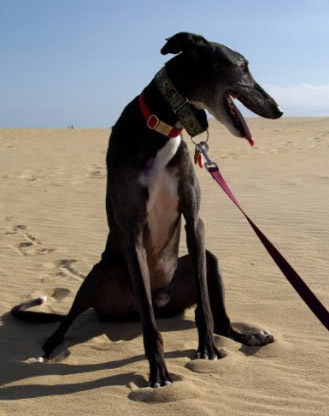 Do greyhounds sit? Of course they do!! Badal had a lot of fun at the beach walking and taking a break by sitting in the sand! Congratulations, Badal, for making it into the summer issue of Celebrating Greyhounds Magazine! Badal was lovingly adopted by Mike and Mary Brown. Badal is an ambassador at two of our meet and greet events each month and everyone who meets him falls in love. Badal has a HUGE fan club and we are happy that he made it to the big time! !